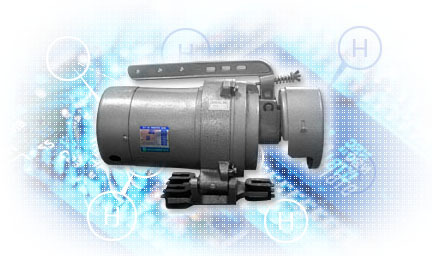 The motor is especially designed with powerful performance for industrial sewing machines purpose. Vibration and noise are minimized. The temperature rising of the motor is extremely low. The size and weight of the flywheel eliminate speed reduction when it engaged with the clutch. Heavy-duty lining material prevents any slipping. 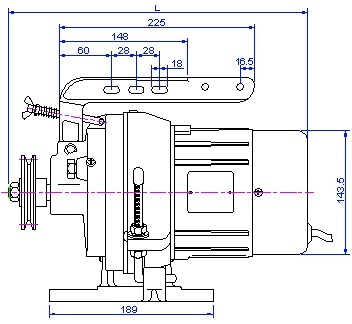 Therefore the accurate clutch operation permits instant starting and stopping of the sewing machine. The operating lever can always be kept in line with the pitman rod and foot treadle. Loosen the bracket holding screw so that the pulley side can end of bracket rotates freely. Now adjust the clutch lever to the most suitable operating position. Then, tighten the bracket holding screw and commence operation. 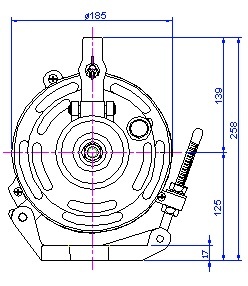 The motor is provided with a belt tightener of American dimensions. The tension of the belt is easily adjusted by simply loosening the adjustment nut. 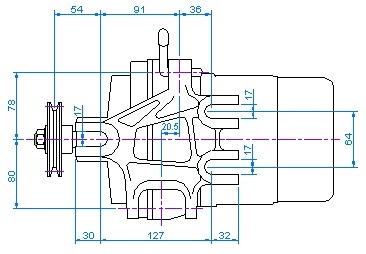 Dimensions for EURO-standard installation is available. Just change the switches, the reverse ration and the voltage are easily obtained without changing the troublesome wiring.